Cold Forging is the main process we use to produce our Forged Precision hangers and baseplates. We were the first truck manufacturer to use this technique to create stronger, lighter and tougher trucks specifically for longboard and downhill use. We believe it is the future, as it allows higher strength than casting, and lighter weight than a purely CNC‘d truck. A little post forged CNC work then gives us an affordable, full precision truck. Forging is one of the oldest metal working methods known to man. It is used to create high-strength, ultra-hard objects like tools, weapons and high-stress engine components. Rather than melting the metal stock and casting it into the shape of a mould, the raw metal billet is placed in a die and hammered into shape with a powerful hydraulic hammer. The metal grains are perfectly aligned to the shape of the part, the surface is exceptionally strong, and it has excellent resistance to impacts and fatigue over continued stress. Casting has a random grain structure, and fails to preserve any grain strength in the original material. CNC operations actually remove surface hardness from the stock Billet by leaving the grains open ended. Forging aligns the grain structure with the shape of the finished piece, resulting in an approx 30% increase in strength to the original Billet, making it possible for us to make much lighter trucks. We use Cold Forged 6061-T6 Billet to produce our Forged Precision hangers and baseplates. Forged hangers and baseplates are subjected to various CNC operations on areas that require a super-high tolerance, such as the pivot, kingpin mount, and axle studs. 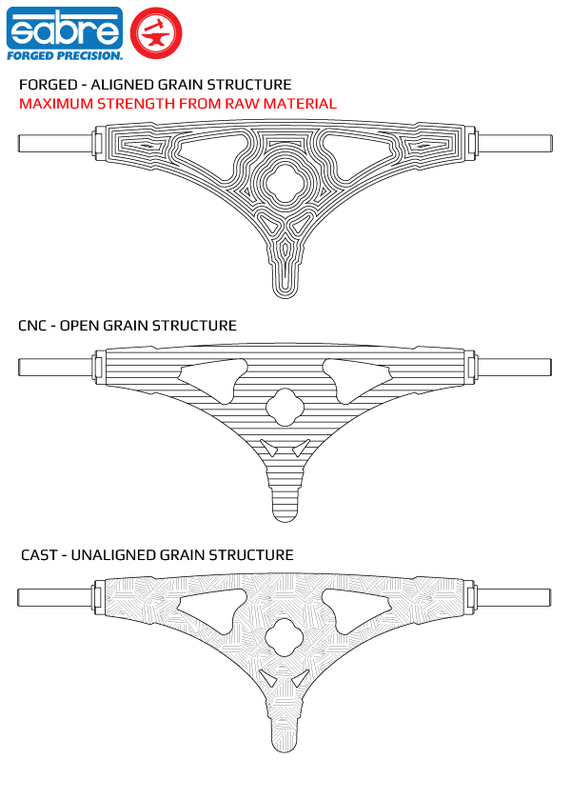 Comparing the grain structure of Cold Forged, CNC'd and Cast hangers.